As the 1970’s were nearing an end, the big three started catering to a developing performance truck enthusiast market. Trucks were being seen as more than just work horses, and because they flew under the insurance nannys’ radar, they could be equipped and sold as fairly aggressive performance machines with lowered stances, big block motors, and eye-catching paint jobs – all the better to cruise the boulevards of downtown America on any given night. The ’78 Dodge Warlock was the follow-up to the Dodge “Lil’ Red Express”, and though a 225-cube slant six was the standard mill, the trucks frequently rolled with everything from a 318 up to the impressive 440 V8. Auto World works a little modern model voodoo on this older Ertl mold and captures this iconic pickup in all its glory, sporting an original Sunfire Orange paint job, highly detailed gold pinstriping, and matching gold spoke wheels. The opening hood, doors and tailgate all align impeccably, and a quick peek under the hood reveals a well detailed, accurate mid-line 360 V8. Behind the opening doors lies a well replicated interior, with correct black bucket seats and a good level of detail. Limited to only 1000 pieces, this is a hauler you won’t want to miss. 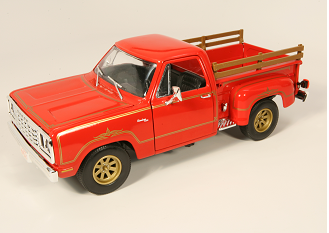 I have the Lil Red Express version with the chrome stacks behind the cab. 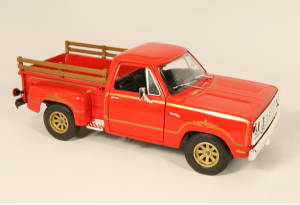 It also is a very nice rendition of the 1978 Dodge by Ertl. It has the Goodyear GT Radial logo on the tires which I don’t see on the picture of the Warlock version. Ertl has made some nice die cast in the past.